CHARLOTTE— Third-seeded USC Aiken eliminated No. 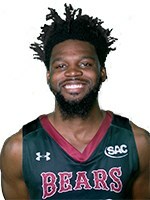 6 seed Lenoir-Rhyne University in the first round of the NCAA Division II men’s basketball tournament Saturday, winning 84-71 at Queens University. The Bears, who finish 21-10, trailed 39-23 at the half. Cory Thomas led LRU with 24 points but the Bears did not have any other scorers reach double figures. He also had 10 rebounds. Xavier Barmore led USC Aiken (26-5) with 31 points, Ty’Lik Evans added 21 and Doniel Dan had 13 points. USC Aiken plays No. 2 Augusta (Ga.) at a time to be determined on Sunday at Queens. The other two games are Queens on Saturday are No. 8 Emmauel for No. 1 Queens at 5:30 p.m., followed by No. 5 UNC Pembroke against No. 4 Catawba.